My goal as an instructor is to free the IT Professional from the daily grind of the office through knowledge and automation. Jason Yoder is a lifelong technology enthusiast, a Microsoft Certified Trainer, and a Chief Petty Officer in the United States Navy. Jason holds a Bachelor of Science in Computer Science degree as well as high level Microsoft certifications on all operating systems from Windows NT 4 to Windows Server 2012. Jason started his career in 1997 as the Technology Coordinator for a public system in Indiana. He then moved to a regional engineering company in Indianapolis and helped to take them to both a national and international level. As a Chief Information System Technician in the United States Navy, Jason works to improve naval computer systems and to train junior Sailors to become IT Professionals. Jason specializes in delivering training for Windows PowerShell, Server, and Client. His clients span public, private, government, and military organizations and has delivered training in Europe, Asia, the Middle East and North America. 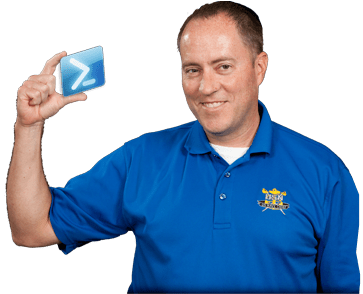 He is also a technical reviewer for Microsoft’s official training on Windows PowerShell and the moderator for the Active Directory forums on PowerShell.com.